This marvelous small box was painted by V. Sindyukov from the village of Fedoskino. 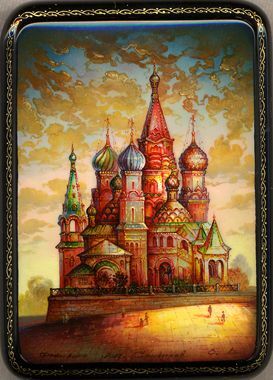 It shows the famous historical monument , the Saint Basil's Cathedral, which is located in the Red Square. Besides oil paints the artist has used here mother-of-pearl, and gold dust. The box is constructed from quality paper-mache made in the village of Fedoskino. The interior of the box is covered with red lacquer, the box's exterior is covered with black lacquer. The lid is hinged, and the box sits flat. The work is signed by the artist.